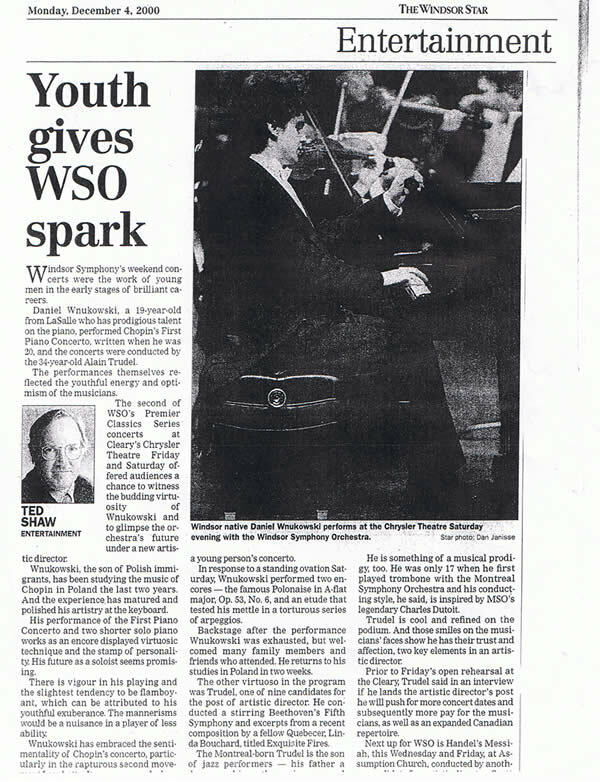 Windsor Symphony’s weekend concerts were the work of young men in the early stages of brilliant careers. Daniel Wnukowski, a 19 year old from LaSalle who has prodigious talent on the piano, performed Chopin’s First Piano Concerto, written when he was 20, and the concerts were conducted by the 34-year old Alain Trudel. The performances themselves reflected the youthful energy and optimism of the musicians. The second of WSO’s Premier Classics Series concerts at Cleary’s Chrysler Theatre Friday and Saturday offered audiences a chance to witness the budding virtuosity of Wnukowski and to glimpse the orchestra’s future under a new artistic director. Wnukowski, the son of Polish immigrants, has been studying in Poland the last two years. And the experience has matured and polished his artistry at the keyboard. His performance of the First Piano Concerto and two shorter solo piano works as an encore displayed virtuosic technique and the stamp of personality. His future as a soloist seems promising. There is vigour in his playing and the slightest tendency to be flamboyant, which can be attributed to his youthful exuberance. The mannerisms would be a nuisance in a pianist of less ability. Wnukowski has embraced the sentimentality of Chopin’s concerto, particularly in the rapturous second movement. In response to a standing ovation Saturday, Wnukowski performed two encores – the famous Polonaise in A-flat major, Op. 53 no. 6 and an etude that tested his mettle in a torturous series of arpeggios. Backstage after the performance Wnukowski was exhausted, but welcomed many family members and friends who attended. He returns to his studies in Poland in two weeks.